Roman Fluegel and Joern Elling Wuttke came together as a production team in the late `80`s after both collecting valuable music experience from previously being in various bands. 1993 - Together with the Djs ATA and HEIKO MSO, established three labels, ONGAKU, KLANG ELEKTRONIK and PLAYHOUSE. They released several maxi singles and an album under the pseudonym ACID JESUS. Later they changed their name to ALTER EGO and founded SENSORAMA, an outlet for their more ambient tracks. The first ALTER EGO LP appeared 1994 on SVEN VAETHS HARTHOUSE label, which was at that time, one the most pioneering labels from Germany. The impact of this LP on the British music scene was headlined by remixes from BLACK DOG, LUKE SLATER & DAVID HOLMES. The success of these projects in England led to the album »DECODING THE HACKER MYTH«, following up with an UK tour as a live act. The LP also included a bonus remix CD with contributions from ANDREW WEATHERALL`s TWO LONE SWORDSMEN project,MATTHEW HERBERT, LUKE SLATER and ALTER EGO. 1997 - ALTER EGO released their last single ABSOLUTE for Harthouse and since then they worked for their own label KLANG ELEKTRONIK. 1999 BETTY FORD, became one of the biggest club hits of that year. 2000 - The SLAUGHTERHOUSE EP was released, including BETTY FORD remixes from DJ RUSH, WASSERMANN (Wolfgang Voigt), JUSTIN BERKOVI and Ekkehard Ehlers & Albrecht Kunze`s MAERZ project. 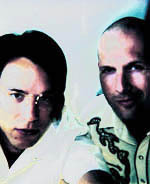 In the two following years ALTER EGO were busy doing a co-production with SVEN VAETH for his albums, CONTACT and FIRE.